Lately I've been working on a few different projects and trying to complete a new addition to my Handbag Project which is really exciting. She's utterly gorgeous and I'd let you know who she is, except I don't want to ruin the surprise when it's finished. She likes lots of colour so I got together some colourful bits and pieces to inspire the drawing. And I also bought the latest LOVE magazine. It never fails to confuse me that every editorial within the magazine looks so much like an advert, but in a way it makes the whole aesthetic of the magazine look so coherent and streamlined. 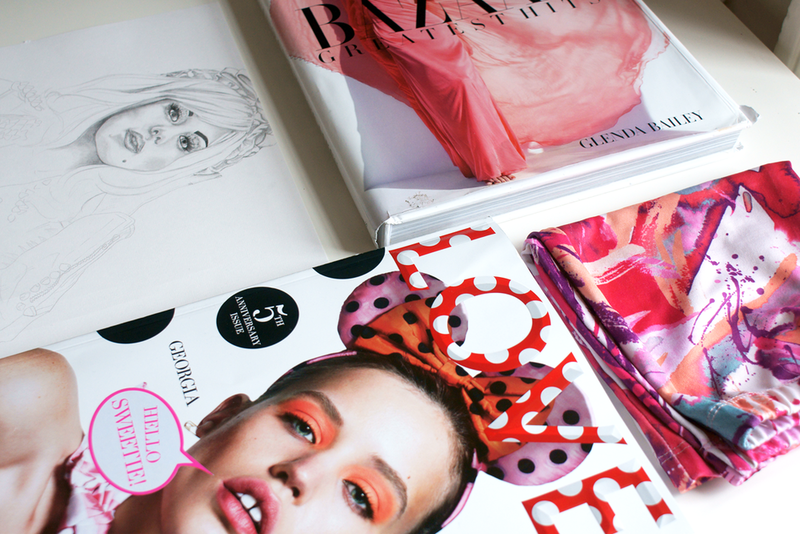 I've also featured the Harper's Bazaar: Greatest Hits book which is a complete wealth of fashion inspiration through the ages and something I use to inspire me when I'm feeling uncreative. I'm also having a severe case of failing to time manage everything I do in a consistent way lately. Can you relate? Most of the time I half complete ten things rather than fully complete five. I definitely need some tips!